Greenpois0n RC6 to jailbreak Apple TV. After the release of Greenpois0n RC5 untethered jailbreak on iOS 4.2.1 now for both Mac OS X and Windows, here comes some good news about Apple TV 2G users. iPhone hacker pod2g has confirmed that Greenpois0n RC6 will be available soon to bring untethered jailbreak on iOS 4.2.1 for Apple TV 2G. 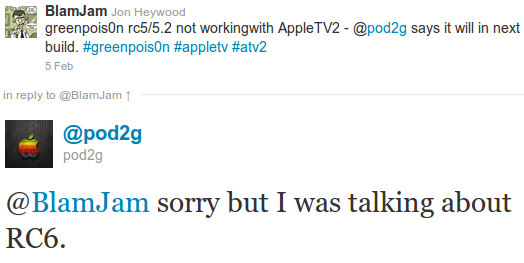 lamJam: greenpois0n rc5/5.2 not workingwith AppleTV2 – @pod2g says it will in next build. pod2g: @BlamJam sorry but I was talking about RC6. Besides, Greenpois0n RC5 readme contains supported devices which includes Apple TV 2G support coming in the RC6. greenpois0n will Jailbreak your iDevice. In meantime, you can use the Windows and Mac OS X version of Greenpois0n RC5 to untether iOS 4.2.1 jailbreak for all devices mentioned above in the readme. We’ll keep you informed whenever the RC6 version is released. Stay tuned. This is a syndicated post, which originally appeared at Geohot . View original post. This is a syndicated post. If you are interested please read the full article from its original source at Geohot.